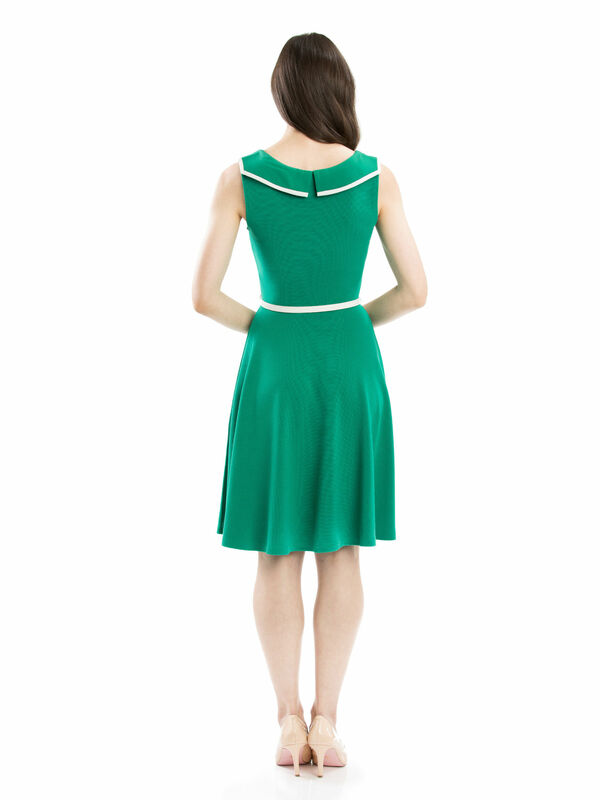 Serendipity Dress https://www.review-australia.com/au/serendipity-dress-emerald-green/RE19DR291.REGRN067.html Sporting clean lines and a subtle retro vibe, the Serendipity Dress is set to be a new wardrobe staple. It's crafted in a stretch mid-weight fabrication and is gently fitted through the bodice. Contrast white trims and a removable patent belt at the waist add structure to this knee-length dress. Wear with a cropped cardi and heels for workwear or dress up for evening with a red lip. Sporting clean lines and a subtle retro vibe, the Serendipity Dress is set to be a new wardrobe staple. It's crafted in a stretch mid-weight fabrication and is gently fitted through the bodice. Contrast white trims and a removable patent belt at the waist add structure to this knee-length dress. Wear with a cropped cardi and heels for workwear or dress up for evening with a red lip. Serendipity Dress is rated 4.8 out of 5 by 84. Rated 5 out of 5 by Gill75 from The colour is just gorgeous - beautiful fit. Brought this online in late November. I normally wear business suits to work, so was looking for something that I could wear on 'casual Friday' that was not jeans and a polo shirt as I am still often required to see clients. I match it with the Review Beverley Peep Toe Heel which is a cute combination. Last week also wore with tan sheer tights and a closed toe heel (similar colour) that looked very elegant. Slightly more formal look but still very summery! There was no clinging of the material to the tights which was great! Length of the dress is delightful also. A must have!!! Rated 5 out of 5 by Kariony from Gorgeous fit and beautiful shade of green! I'm so glad I tried this on as I adore this shade of green. I recently returned the Sweet Chariot dress, which is the same fabric as this one, as it really didn't sit nicely on my body so I assumed this would be the same. Was pleasantly surprised as to how lovely it is! Sits beautifully and doesn't cling to areas you don't want it to cling to! I can see myself wearing this dress a LOT! Other reviewers have said they feel it is too hot for Queensland Summers. I really struggle in the heat and actually find this quite comfortable, unlike some of the polyester dresses I own. Rated 5 out of 5 by Amy-Boylan from Lovely colour and fun dress I bought the serendipity dress last Sunday and received it that Friday. I got to wear it last night whilst out in city with girlfriends. It is just a comfortable dress, that moves well with your body movements. Absolutely love the colour of the dress and the white piping on the collar. The neckline is a fun neckline that isn't too low so will be such a great dress for work as well. Love how their is no zippers so makes wearing her very easy as you don't have to do gymnastic contortions to get the zip up on your own. Highly recommended this dress. Rated 5 out of 5 by HelenBou from Vibrant, pretty and practical! So happy with this dress! Suitable for work and many other occasions. Dear Review you win me over with your beautiful, feminine necklines! Normally I’m a size 12 around the tummy but I got the size 10 in this style because of the stretchy fabric. Question to your designers: wondering if the fabrics can have a cotton blend in future designs? Also, don’t know how other ladies feel, but because I’m not tall like your models, am wondering if shorter lengths are possible? For now, however , am totally loving this dress!! Rated 3 out of 5 by Maryrt from Fantastic but wrong material for summer! Have been lusting after this dress since it’s release ( as I’m not a floral dress person). This dress is stunning and would be perfect for anything! But the fabric is just too thick for a Queensland summer. Much better suited to a colder climate or if you’re in air conditioning all the time. Wish I could have kept this beauty- Review, PLEASE make summer dresses in summer ( light!!) fabrics!! Rated 5 out of 5 by JoReviewGirl from Cute and comfortable! A lovely cut that is perfect for running errands or coffee dates. 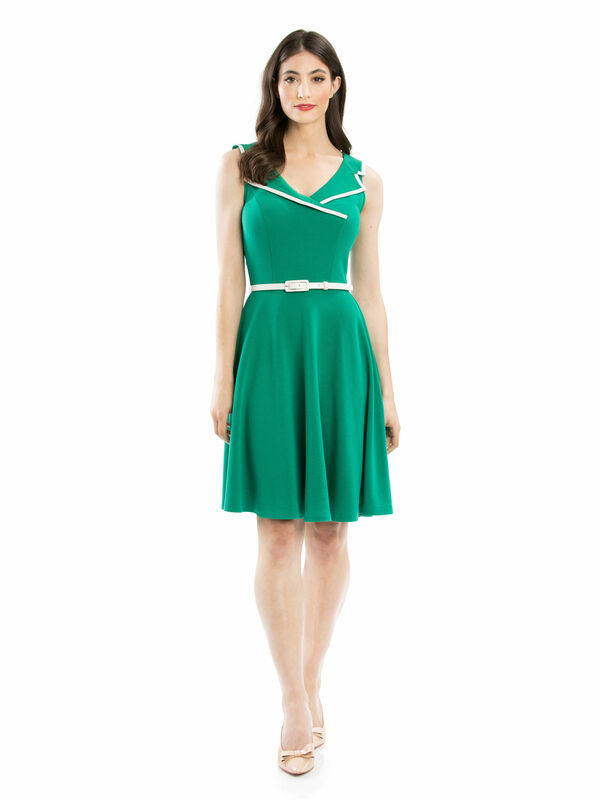 I love the cute 'retro' collar detail and fit and flare style of the dress. I have had to be mindful of my underwear choice when wearing the Serendipity Dress, as the material is slightly clingy/visible to seams etc. The bust is also a little roomy but I found a sz10 to be comfortable for a 10-12DD. Very happy with my purchase! Rated 2 out of 5 by Lisa Jane from Lovely colour but strange fit A lovely colour of green and a great length. I purchased but returned as I found the fit to be too strange - the size 10 was too clingy and showed off every lump and bump; the size 12 was more like a size 14 and drowned me in material (I am a size 11). The collar also sticks up on some of the dresses but not others, so best to try on a few if possible for the best collar fit.